When I picked up Christmas in The Duke’s Arms, I went into it with trepidation. I expected…well…Dukes. And while I don’t have a problem with Dukes per se, I do have a problem with the sameness of Dukes: powerful guy, lots of wealth and responsibility, inevitably rakish, rarely seen doing any government work or estate business despite that I can only imagine those things took at least some amount of their time? I need not have worried. In fact, only one of the heroes in these novellas is a Duke. And even that Duke bears very little resemblance to the stereotypical romance Duke described above. Rather, the title refers to “The Duke’s Arms” a pub that serves as one of the loose ties that hold these four stories together. There are others and we’ll get to that below when I explain what candy canes are doing in a Regency romance review. Each of these stories has something to recommend them. The main thing I appreciated about each is that they didn’t try too heart to force the cheer and sentimentality. The first story, A Knight Before Christmas by Grace Burrowes, does have a number of fluffy bunnies, but as breeding rabbits, they hardly fit the stereotypical mold of the puppy-cover Christmas romance. This novella features the unconventional courtship of a widow and her deceased husband’s man of business, himself a widower. The heroine, by virtue of an odd stipulation in her deceased husband’s will needs to marry rather quickly and while the two have an affinity, there is an evil other woman holding up the show. The EOW trope is not one I’m fond of in general, but the way the conflict was resolved was hilarious; a farce, but one I enjoyed. The second story, In The Duke’s Arms by Carolyn Jewel, who I’ve heard wonderful things about, but hadn’t read, features the only actual Duke of the bunch, a busy, distinguished fellow who tends to scare everyone around him, including his heroine. My favorite aspect of this story would be a bit of a spoiler, but suffice to say that I very much appreciated that the Duke of Oxthorpe is pretty much the opposite of the stereotypical historical romance Duke. He was socially isolated as a child and doesn’t engage easily with other people. Heroine Edith Clay is very much the opposite as everyone likes her, except perhaps for her relatives. Seeing her wake up to the truth of Oxthorpe’s personality and regard for her is a joy. And all those other Jewel books I’ve got languishing on my TBR just got bumped up several notches. Licensed To Wed by Miranda Neville features another man bound by duty and ambition with designs on his now penniless childhood neighbor. In contrast to Jewel, I’ve read all of Neville’s books and for the most part enjoyed them all. I was not at all disappointed by this one in which the poor orphaned girl who may never receive another offer of marriage rejects her dutiful, determined suitor out-of-hand right at the beginning of the story. Wyatt Herbert, Viscount Carbury, is a bit of a stick in the mud and a touch OCD, making to do lists of items, big and small, which get progressively funnier. Robina Weston is delightfully independent, but not excruciatingly so, making this clash of wills most enjoyable. The final story, Spy Beneath the Misteltoe by Shana Galen, was the odd one out in a number of ways, a send-up of 007 Bond spy lore recast as a romance between two competitive spy colleagues. It didn’t work quite as well for me as the other three novellas, but still had its charms, including the resolution to another plot thread running through the other stories, that of a highwayman terrorizing the road through the neighborhood in which the stories are set. Christmas in The Duke’s Arms had a little drop in price over the weekend as well. It’s now 99 cents at Amazon so if you were holding off, now is the time to snap it up. If you’re an historical romance reader looking for a short and sweet but not saccharine holiday read, I definitely recommend it. One of the neat things about Christmas in The Duke’s Arms is that not only do the characters in each story visit the book’s namesake pub, many of them also end up at the same Christmas party at the home of Penelope Carrington. Since I’m not a big historical recipe developer, instead of coming up with a Regency treat that might appeal to a modern palette, I thought I’d just pull together a last-minute hostess gift idea for the holiday parties you might be attending in the upcoming week. The whole mix-in-a-jar idea isn’t new. 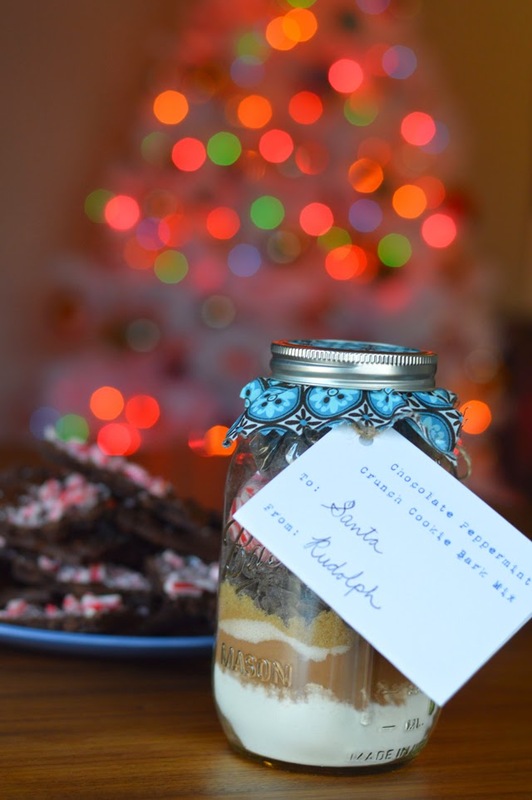 But sometimes I’ve gotten gift cookie and cake mixes that 1) suffered from being in a jar because the order ingredients are mixed isn’t ideal, and 2) require you to add so many things, you might as well just have baked it from scratch yourself. 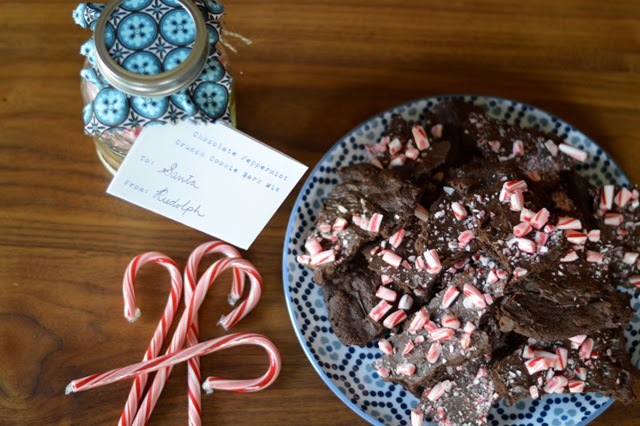 This recipe is super simple because all the gift recipient has to add are one stick of melted butter and a couple tablespoons of water. No eggs, no shortening or perfectly softened butter and no vanilla or other liquids. And since you just spread all the dough out in a slab, the instructions are pretty easy too! This kind of project is helped by having a stash of craft supplies. I sew and do some paper crafting so I had the pinking shears, scrap fabric, hole punch, cardstock and twine on hand. If you had to go out and buy all that stuff, this might end up getting a little more expensive. Oh, and here’s a printable gift tag/instruction sheet for the mix. The ingredient list below is a total shopping list: the amount of each ingredient you’ll need for 6 gifts. If you just want to do one gift, you can use the amounts in the first line of the assembly instructions below. Otherwise you’re going to have to do some math. Sorry! 1. In each jar, from the bottom up, layer 3/4 cup flour, 1/4 teaspoon salt, 1 teaspoon vanilla powder, 1/4 + 1/8 teaspoon baking soda, 1/4 cup cocoa, 1/4 cup + 2 tablespoons white sugar and 3/4 cups chocolate chips. Put 1/2 cup crushed candy canes and 3/4 cups chocolate chips in two separate ziplock bags and put in on top of the mix. 2. Lay the top on the jar. Print and fold the gift tag/instruction sheet. Punch a hole in the upper lefthand corner. 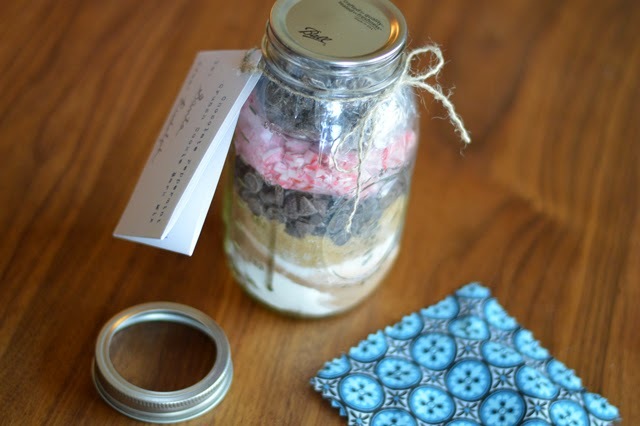 Using twine or ribbon, tie the tag to the neck of the jar. Lay one fabric square over the top of the lid and use the rim to screw down both the lid and the fabric. 1.Preheat the oven to 350 degrees. Ready an unlined baking sheet. 2. 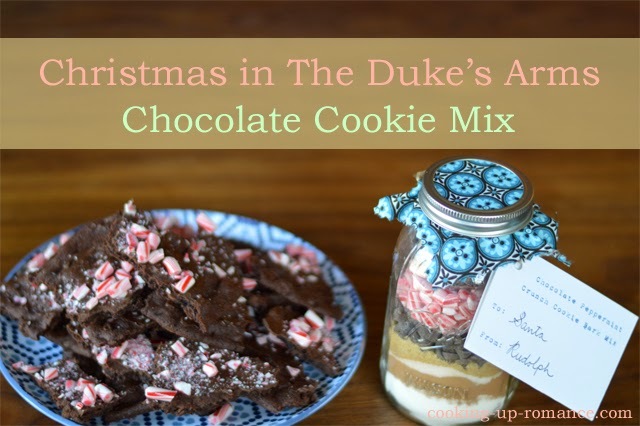 Take out chocolate chip packet and candy cane packet and set aside. In a medium bowl, thoroughly combine the remaining jar contents with ½ cup melted unsalted butter and 2 tablespoons water. 3. Leaving a 3-inch margin on all sides, spread dough into a rectangle that measures about 11-by-8 inches. Pat it into an even layer. 4. Bake 12-14 mins until top looks dull. When done, sprinkle the chocolate chips from the packet over the cookie slab. Let the chocolate chips sit for 5 mins to melt, then use a spatula to spread it. 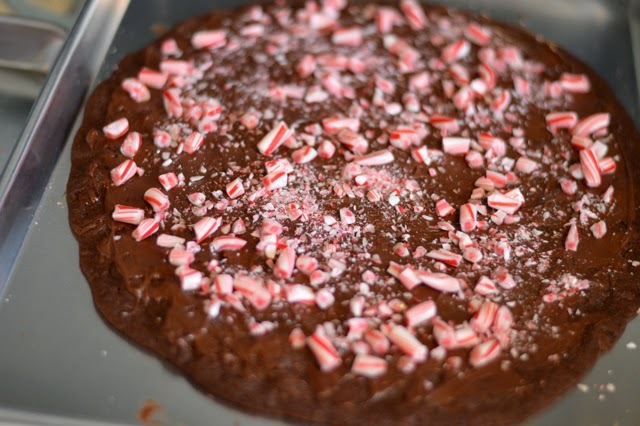 While chocolate is warm, sprinkle candy cane packet on top. 5. Let cool on baking the chocolate topping is firm, about 2 hours. Break each cookie slab into about two dozen 2- to 4-inch-long irregular pieces.